Small indeterminate plants bear prolifically and must be staked or caged. Small plum (2 ounce) type. Tomatoes set on clusters of 7–10 fruit. They hold extremely well on the vine. 72 days. Eat fresh in salad or dry for sun-dried tomatoes. They also make outstanding oven roasted tomatoes; slice in half, drizzle with some olive oil, bake at 250 until mostly done, sprinkle with fresh basil, oregano, etc. Eat as a contorno or freeze. 1.5 gram packet @ 300 seeds. Notes: The Principe Borghese tomatoes are grown around Naples and the southwestern region of Italy, where they’re called piennolo pomodori (hanging tomatoes). It seems piennolo is Neapolitano dialect for appeso, or “hung.” During the winter, the tomatoes are stored in home attics hanging from the ceiling. Indeterminate. Golf ball-sized tomato, yellow/red on the outside, red/yellow on the inside. Amazing production. Holds forever on the vine. Good taste; very nice salad tomato. Mid season. Fruit last an incredibly long time after harvest; sometimes the last tomatoes you’ll eat in the year. 3 gram packet. Ponderosa was the trial tomato this year. This is a storage tomato. It is semi-determinate and produces a large quantity of golf ball sized fruit, yellow on the outside and red on the inside. It is late for such a small tomato and most of its fruit are ready at the same time. In Italy, what they do is pick the entire plant and bring it inside and hang it upside down in a dry storage area. The fruit will hold for months. I grew mine in cages and it was pretty much impossible to pull the entire plant so I picked them like a regular tomato. This year, the tomatoes were ready to pick in mid September although I did not pick them until the October 8th or so. They were stored in my seed packing room which is fairly cool. The photo of them is how they looked around Thanksgiving Day. I suspect they will hold at least another month and had I given them proper care, perhaps longer. While the taste is nowhere as good as a Red Pear tomato at perfection, they are pretty darn good in late November when you compare them to what is available in the store. Good tomato. Note: These were the closest to the Aprile tomatoes. 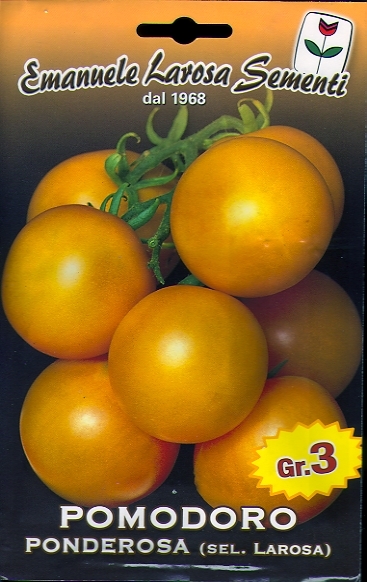 The tomatoes from the Seeds of Italy trial may not have lasted as long as they could have since they were stored off the vine. All the tomatoes we saw in Puglia were stored hanging with some of vine attached. AKA pomodoro galantina from the town in Southern Puglia where it is from. Determinate red cherry, grape shaped. Heavy producer of very good tasting & sweet fruit that hold well for a long time on the vine. Dries extremely well. Fruit also last a long time when picked. This variety does well in a container. Note: No longer available through Seeds from Italy.